The most successful era in Philadelphia Phillies history starts another chapter on Friday, April 1st. Expectations are extraordinarily high this season as possibly the best pitching staff in history takes the mound day after day. Despite numerous questions about the lineup and middle relief, this Phillies team is poised to once again win the NL East and go deep into the playoffs. Can Jimmy Rollins regain any part of his form that led to an MVP season in 2007? Can Ben Fransico and eventually Domonic Brown produce close to the same level as Jayson Werth the past two years? Will Chase Utley ever get back on a HGH cycle so his knee can heal? These are all questions that will be answered throughout the season. Last year Oswalt-less for half the year, Kyle Kendrick starting games instead of Cliff Lee, and with a mediocre to below-average offense, they won 97 games. This year, I think they at least match that, if not exceed it. Key addition - Luis Castillo? Oh yeah...and who wins the division? Castillo being waived is addition by subtraction. Didn't read the rest of the post, huh? I predict that Rollins will be a .275 hitter with a .325 on base % but everyone will worship his dong none the less. 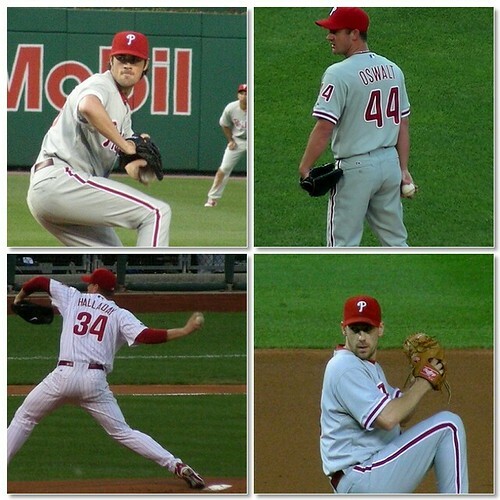 I predict that Cole Hamels will find ways to lose games while looking like the best pitcher on the rotation. I predict that Joe Blanton will sweat. A lot. I predict that Chooch will be a fan favorite despite hitting .250. I predict that they will easily win the division and everyone will spend stupid amounts of time and energy trying to make fun of Havas for his predictions. I predict that Havas will point to various ambiguous statements that he made to indicate that he was in fact right all along no matter what the actual outcome. I predict that I will occasionally stop by to irritate the haters and true believers alike. Lots and lots of puns. And I also predict 102-60 for the final record. And Hunter Pence will be a Phillie. I would have been fine with Castillo and thought he played himself onto the roster with his patience at the plate and the few hits he got. Stark was on with Missannelli earlier saying Castillo not making the roster is good news on the Utley front in that Castillo would be worthless once Utley comes back since he can only play 2nd base. He also made some comments about Castillo lackluster play in the field and the fact that he showed up late. there are going to have to win 2-1 and 3-2 games for the foreseeable future and in that case you want valdez at 2b. his defensive advantage over slick lou >>> lou's offensive advantage of wilson! wilson! braves...gimme the braves + half the amount of games you think the phils will win the division by...what would that be like 7?